In tenth grade, our chemistry teacher forced our class to dress up in lab coats and lab goggles and to stand on the stage in the auditorium in front of the entire high school at assembly and sing the Elements Song by Tom Lehrer. This wasn't a punishment. I think she honestly believed this would be "fun". 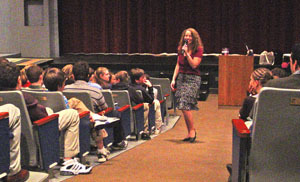 Last Tuesday, I returned to that very auditorium as part of a school visit to my old school, Bancroft School in Worcester, Massachusetts, which I attended from 6th grade through 12th. I was a wee bit nervous. You see, this -- visiting my old school -- was something I'd dreamed about doing for a long, long time. 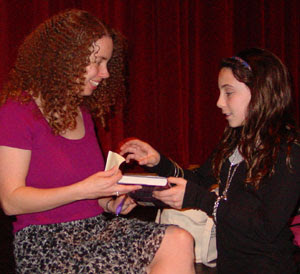 I remember being in sixth grade and sitting in the audience for an assembly and daydreaming that I was a published author, invited back to talk to the school, and that I wasn't too shy to, y'know, speak. So this was a Big Deal for me. I had at least three nightmares in preparation for my school visit: one where I'd forgotten to put on pants, one where I forgot what I was going to say, and one where I opened my copy of INTO THE WILD to find that all the text had been replaced by the Periodic Table. I saved myself from the first nightmare by wearing a skirt, the second nightmare didn't happen, and I haven't had the nerve to check inside a copy of INTO THE WILD for the third nightmare. But that's okay because the school visit to Bancroft was AWESOME. I'm talking bottle-it-up-and-save-it awesome. I'm talking Snoopy-Dance-of-Joy awesome. 4am - Woke up. Felt like my throat had been skinned. Lurched to shower. Opened mouth to practice talk as showered. Sounded like Jabba the Hut. Panicked. 5am - Debated with husband about whether I could go. Tried to do talk again. Sounded like Jabba the Hut after eating Kermit the Frog. 5:30am - Downed a cup of hot chocolate. Decided I was going anyway, dammit. 6am - Ferry to Connecticut. No talking. More hot chocolate. 11:25am - Arrived at Bancroft. Tested voice. Sounded a little less like I'd eaten Kermit the Frog and more like I was Kermit the Frog. Decided that was an improvement. I rather like Muppets. 11:30am - Met my excellent host Sydney Patten, the Cultural Events Coordinator. (I was a Cultural Event. Neat to be referred to as an event.) Saw some familiar and friendly faces in the front office. Also got tour of the school. The school is now a mix of bits that are the same as I remember (like the theater/auditorium and the stairwell to the library) and brand-new bits (like the playground on the hill instead of a building and the fireplace in the main lobby). The upper school lockers are the same, and students still don't lock them. But the old cafeteria (site of many an awkward school dance) is now the Multi-Purpose Room, and the old gym is now the cafeteria. It felt surreal to be there. Memories poured over me, and there I was, the Cultural Event. Highlight of the tour was the theater (which was exactly the same as it was when I stood on that stage in lab coat and goggles). I walked in there, and two high school kids looked over at me and then did double-takes. "Hey, it's the author!" one of them said. The other said, "Whoa, this is, like, extra cool." At that moment, I felt extra cool. 11:45am - Lunched in a special dining room with the headmaster, the head of the English department, the director of advanced studies, the school librarian, and other VIPs. Felt a bit like a kid who had snuck a seat at the grown-ups' table. Half of me kept expecting to be sent out to the main cafeteria with the other kids. The other half had a really nice time. We were joined by a special guest: Ms. Tsang, one of my high school English teachers. She's the teacher who really believed in me as a writer and really encouraged me. She no longer teaches at Bancroft, but she came in just to see me. How cool is that? 12:30pm - Assembly for the sixth, seventh, and eighth graders. I began by telling them all about the Elements Song incident and then explaining why I had returned to this auditorium, given my past scarring experience here. I had returned in case there was anyone out there who was like me -- anyone who had an impossible dream. I wanted to say something profound and inspiring to those students who dreamed of writing a book or being on Broadway or climbing Mount Everest. As I confessed in my talk, though, I'm just not all that deep. So I asked them to imagine that I'd said something really inspiring and to treasure those words always. I then talked about writing. The assembly was nothing like my nightmares. Or even like my memories. I remember having cold sweats at the thought of standing up in assembly and giving a thirty-second announcement. Maybe I've grown up. Maybe I'm older, wiser, stronger, more self-confident, and have better hair. Or maybe it's just that they gave me a microphone. Microphones seem to make me braver. No idea why. I think they're magic. At any rate, I enjoyed myself thoroughly. 1:15pm - At the end of my talk, I signed books for a slew of really awesome students. (Actually, all the students were awesome. They laughed at my jokes. Clearly, that's a sign of supreme intelligence and taste. Or at least good manners.) Plus I got to see my AP Bio teacher Mrs. Carlson (one of the best teachers I've ever had), and I got to meet Marissa Doyle of the Class of 2k8 (a group of debut authors with YA/MG books out in 2008, modeled after the Class of 2k7, to which I belong), who lives nearby and had come to meet me and see my talk. 1:45pm - Downed tea. No marshmallows but plenty of sugar. Hoped I sounded more like Katherine Hepburn than Kermit the Frog. Decided that even though I was exhilarated from my presentation, I wasn't delusional. No Hepburn for me. 2pm - Presentation for the fourth and fifth graders in the library. When I asked if anyone had read the book, nearly every hand in the room shot up. Never had that happen before. Had to restrain myself from doing a Snoopy Dance of Joy. 2:45pm - More signing. More talking. 3pm - Interviewed by a super-nice journalist for an article in the Bancroft Bulletin, the school alumni magazine. 4pm - Said good-bye to people and headed home. 9pm - Home. Told husband all the details of the day. Sounded like Jabba the Hut after eating Katherine Hepburn. But it didn't matter any more. I went to bed a very happy Sarah. Congrats on the great visit!